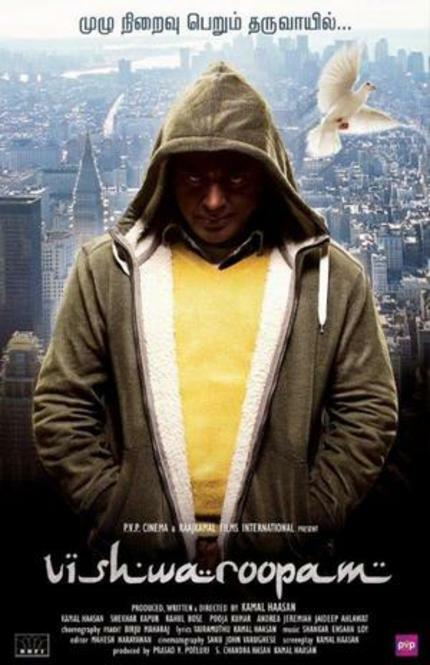 First Look Of Kamal Hassan's VISWAROOPAM Online Now! In a move that has become all too common with big budget Indian features these days (Rowdy Rathore trailer leak, anyone? ), tomorrow's planned unveiling of the first look at Kamal Hassan's Viswaroopam has been foiled by the internet! However, this time around, it would appear that the powers that be are less inclined to be litigious and are giving the image their blessings, recognizing the fact that toothpaste cannot be squeezed back into the tube. Not much is known about Viswaroopam in terms of plot. Some sources say it is a terrorist thriller, some a spy-thriller, and some early reports even mentioned that it would be Hassan's take on Hannibal. What is clear is that the film has not had the easiest road to the big screen, and it's completion was not a certainty by any means. Last year, Hassan and his team were denied entry to the US due to Visa issues, which led to filming delays. Naturally, the crew moved the film to Canada, and life went on. The original director, Selvaraghavan, was unable to commit to the project due to scheduling conflicts, and Kamal Hassan took the reins rather late in the game. Despite all of these problems, anytime Hassan is in front of or behind the camera, it's something worth looking out for. This first look isn't particularly evocative, but it's something to prove that the film is in the works, which is more than we've had for a long time.